Iron Man protects the world from evil villains. He can save your party too. 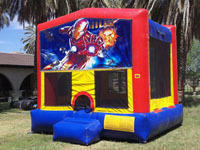 Invite him to your next event and your kids will think you are the Super Hero! You may add a Basket Ball Hoop for $10 upon checkout.